Our founding partners, Mitchell C. Littman and Bernard A. Krooks, are leaders in their fields. Because Littman Krooks provides a powerful knowledge base to clients and the community, our partners and attorneys are asked to appear in local and national media. We offer these videos as an educational resource. Please browse our video collection to learn more about our attorneys and services. What Do the New Tax Laws Mean and How Does It Affect Me? Bernard A. Krooks produces a series of shows addressing elder care, special needs planning, guardianship, asset protection, estate, financial, medical, social and other topics of interest facing our elder population and persons with special needs. 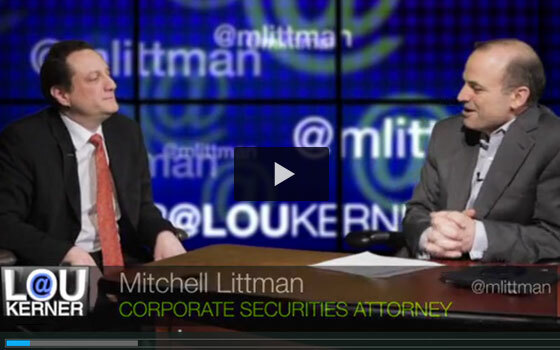 Mitchell C. Littman has a prominent presence in the private secondary market and the growing technology and social space. He is often featured in publications such as The DealFlow Report and has been heard on NPR’s Marketplace program. The Michael J. Fox Foundation for Parkinson’s Research exists for one reason: to accelerate the next generation of breakthrough treatments for those living with Parkinson's disease through an aggressively funded research agenda. In this podcast, we’ll be talking with Mod Rao, Director of Advancement at The Michael J. Fox Foundation, about Parkinson’s disease, the state of science and the work of the Foundation. Yes She Can Inc. founder Marjorie Madfis discusses job development skills for people with autism and learning disabilities and the 2019 Advocates for Adults with Autism Awards, honoring those whose work benefits adults on the spectrum, their families, and our community. Our Elder Law & Estate Planning and Special Needs Planning & Special Education Advocacy attorneys present and participate in webinars to inform the public and our clients about important developments in the areas of elder care, special needs planning, guardianship, asset protection, estate and financial planning.